With the unveiling of bottle art for his newly renamed beer, Green Flash head brewer Chuck Silva proves there's always room for fizzy yellow beer and some humor. Overa a year ago, Silva invented Fizzy Yellow Beer, a low alcohol, straw-colored lager that's as drinkable yet much more flavorful than beers like Bud, Coors and Miller and named after a term made popular by Stone Brewing Co. CEO Greg Koch to describe macrobrews produced by "The Big Three." Recently, Silva decided to rename Fizzy Yellow Beer. The new moniker he went with was Chuckvar. Sounds odd and uninspired at first, but not if you're familiar with Czechvar, the flagship Czech lager produced by Budweiser Budvar (not to be confused with the Budweiser company we're so familiar with in the US). Brewed in Europe since the 1800's, the Czechvar label is instantly recognizable among imported beer fans, so it's likely that Silva's Chuckvar (which I probably don't need to point out, is named after him) will cause a few double-takes among members of that subsect. 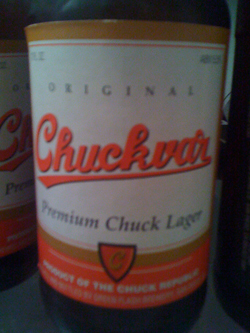 Displayed below, the Chuckvar label design emulates Czechvar almost exactly. The exact location of "The Chuck Republic" is still uncomfirmed, but it's probably somewhere around the intersection of Mira Mesa Boulevard and Flanders Drive (the location of Green Flash's production brewery). Joaquin_de_la_Mesa July 13, 2011 @ 11:05 a.m.
Let us know when the inevitable lawsuit is filed.